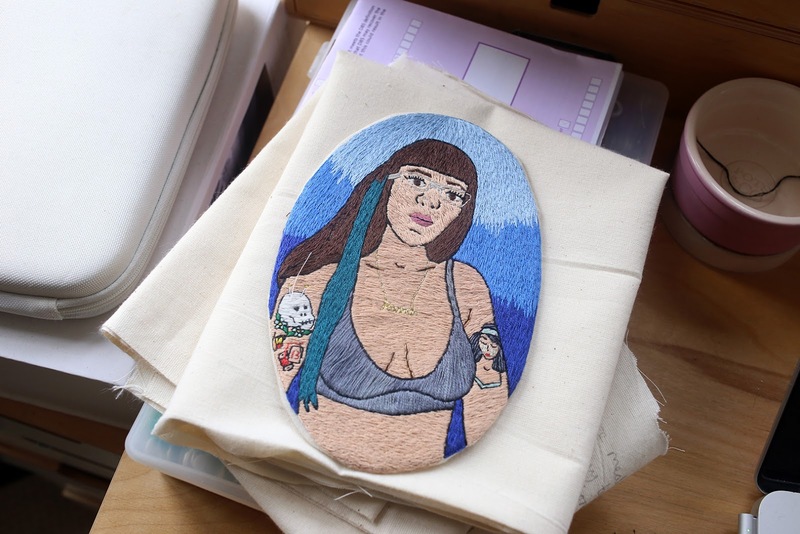 Hannah Hill's beautiful embroidery is bright, colourful and empowering - just like her tattoo collection. Some people say that they feel more confident because of their tattoos or that their tattoos act as a reminder of something significant. What do you draw from them? I can relate to both of those statements. With every tattoo I have added to my body, except one crappy holiday tattoo, which I got covered almost immediately, I have gained more confidence. Whether that’s liking an individual part of my body more or enjoying the body I see overall when I look in the mirror. Some tattoos represent a special person, memory or time in my life, which I think add to my narrative. In your experience, is the actual process of getting tattooed - needle and all - an emotional one? How I feel about the process of being tattooed can differ from the tattoo artist and the actual tattoo. I’ve made some incredible memories just by being tattooed. For example, eating birthday cake with Lal Hardy after me and my best friend had just been tattooed, or going with my parents to get my first tattoo and then a couple years later going to get a matching tattoo with my younger brother. The pain of getting tattooed is something I can handle most of the time, probably because I have extremely painful periods and a history of self-harm. In contrast to that, the pain is worth it because you end up with beautiful art on your body not a scar, which represents pain and suffering. The excitement I feel after getting tattooed and looking in a mirror is so special. It makes me so happy, and that stays with me for some time. I won’t stop staring at a new tattoo. I think my tattoos have made me feel more tough. I am tough, but sometimes I forget that, and to have physical reminders of going through pain is really helpful for my body image. How have your tattoos changed your identity? Do you feel that they convey something about you to the world? I think my tattoos have made me feel more tough. I am tough, but sometimes I forget that, and to have physical reminders of going through pain is really helpful for my body image. I love myself more when I get a new tattoo, so that is a positive effect that they have had on my identity. Different aspects of my personality/character are represented in many of my tattoos such as sexuality, being an embroiderer, mental illness, interests and political beliefs. 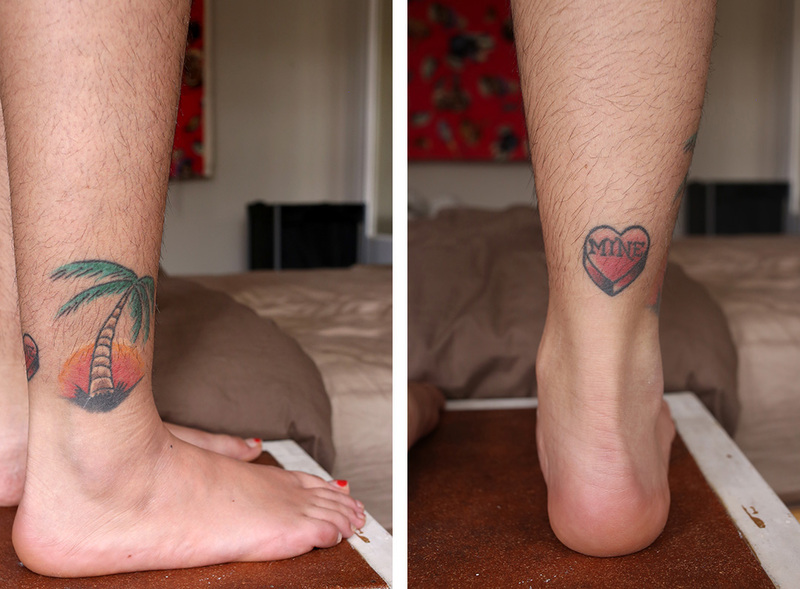 How do you feel about the permanency of tattoos? The permanency of tattoos isn’t something I have dwelled on. I have a history of self-harm, which left me with scars on my forearms. They were something I was self-conscious of for years, but as time went on, I realised they just represent a really difficult part of my life, which I got through. I had attempted suicide numerous times and I see everything I have achieved since then as added time. For these reasons I don’t really care what my body will look like 50 years down the line or if I may regret them as I get older. The way I look at it is, as long as a tattoo is done well, it represents the time at which I got it and for that reason having regrets is pointless. 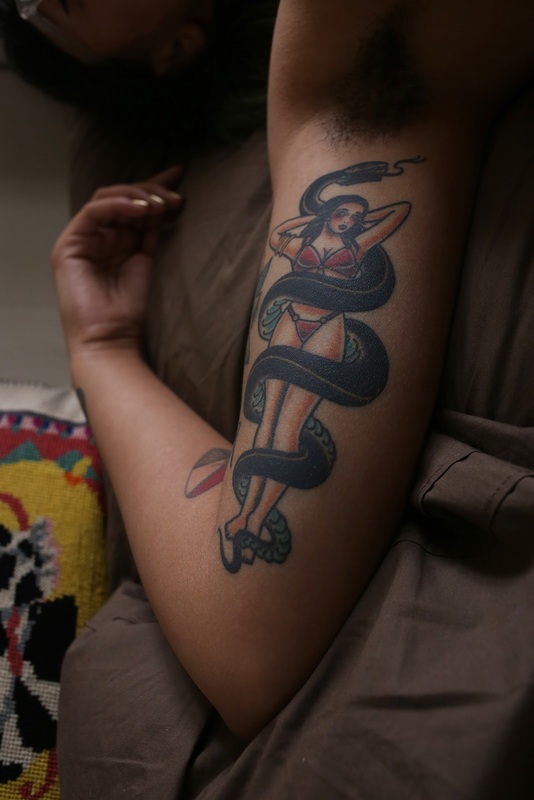 Mainly my issue with representation of tattoos in mainstream media is the sexualisation of women with tattoos, which is really what drew me to this project [Women with Tattoos]. The other photographs in the series really capture how intimate tattoos can be for the person they’re on and that connection was important for me. “Girl’s with tattoos” on all social media show an over sexualised portrayal of women with tattoos bent over motorbikes for men’s magazines, which is totally alienating for me. 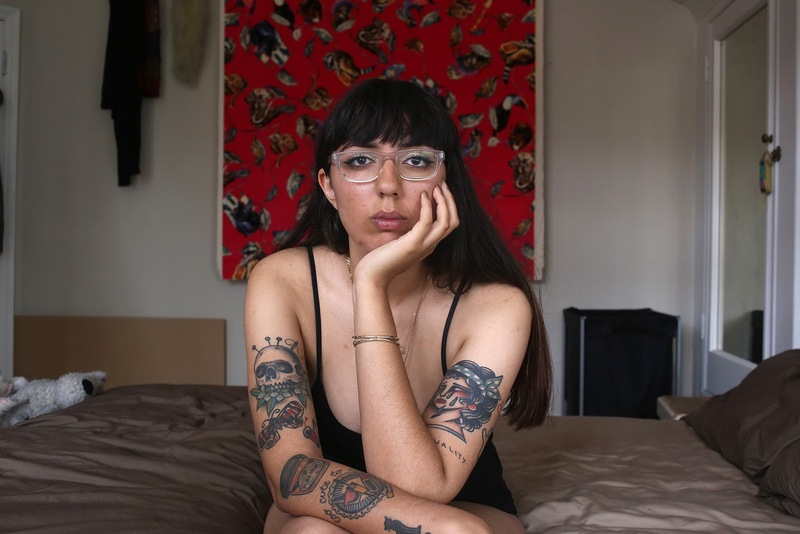 It’s important to keep up with amazing tattoo artists/tattooed babes on Instagram or Tumblr that show much more honest representations of women with tattoos. Which of your tattoos do you have the softest spot for? 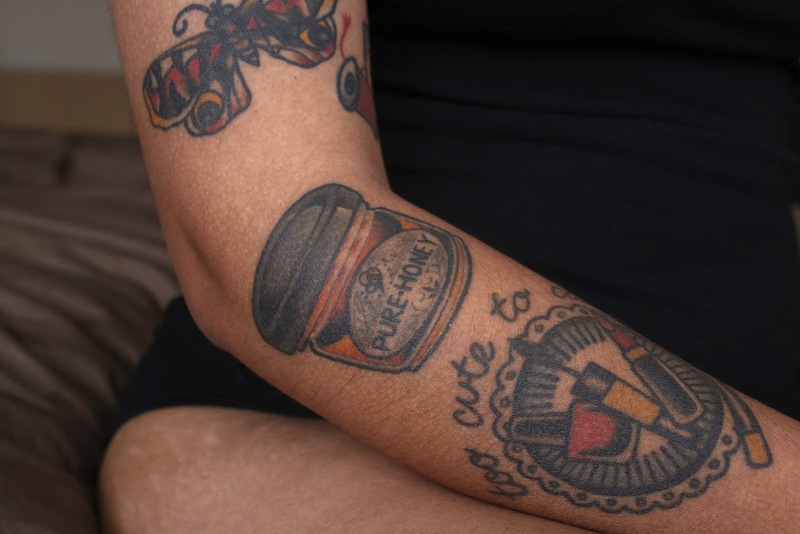 One of my favourite tattoos is a matching honey jar tattoo which I got with my brother. Our grandpa took us to our local park armed with a Winnie the Pooh book and followed Pooh’s trail to find some honey. We walked past a pile of twigs where Eeyore would live and a tree where Owl would live, and all along a trail until we came to a big tree with a little jar of honey at the bottom, which he had put there earlier in the day. That one is very meaningful to us. I also absolutely love my pin-up girl with a snake, which was my first big custom tattoo and was a catalyst for other bigger ones. 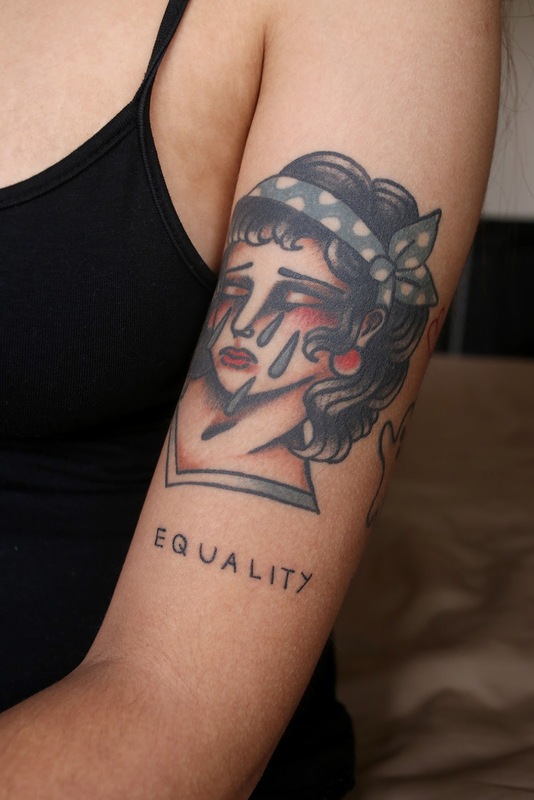 I also got the word ‘EQUALITY’ tattooed on my left bicep with my best friend and hundreds of other people for #tattooforequality, put together by @maisonhefner, where 35 tattoo artists around the world tattooed the word on people for free all day. That was really nice to be a part of.